China’s rise to economic prominence over the past 30 years has rested in large part to its rapid urbanization. Prior to ‘reform and opening up’ that started in earnest during the 1970s, cities in China were viewed as pariahs by the party leadership. Millions of young urban dwellers were forced into the countryside to labor on farming communes during the Cultural Revolution. In stark contrast, today millions of rural migrants make their way to the city. The scale at which this is happening is unprecedented. Currently, there are 85 metropolitan areas in China with more than 1 million people, compared to 51 in the US. 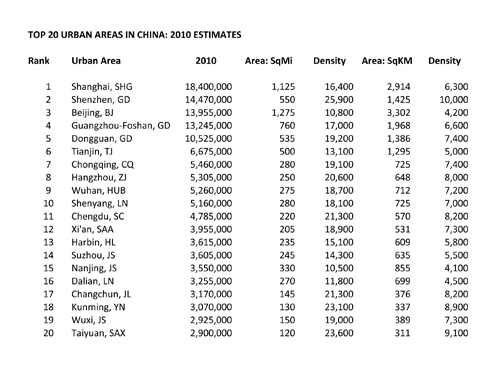 By 2015, urban regions will account for half of China’s population and by 2025, the urban population’s share should reach about 75%. To date, international attention has remained fixated on China’s largest cities of Beijing and Shanghai (and to a lesser extent, Guangzhou and Shenzhen). This is not without good reason, as Beijing and Shanghai are not only the respective government and financial centers of mainland China, but both were host to two of the most visible world events of the past decade: the 2008 Summer Olympics and the recently concluded World Expo. Increasingly, however, the real trajectory of urban growth is shifting to China’s so-called ‘second-tier’ and ‘third-tier’ cities. To the outside observer, China’s lesser-known cities might seem all too similar to one another given the monotonous aesthetic of their newly constructed cityscapes. Indeed, the newfound appearance of Chinese cities is a point of contention among local urban development scholars who are concerned about the converging ‘identical faces’ of these urban areas. Yet to Chinese locals and foreigners who have spent some time living here, it Chinese cities are defined more by their local cuisine, dialect, history, geography, culture and climate rather than their architectural character. These often-overlooked nuances of local culture are much more essential to the identity of these cities than buildings. In the future, these distinctions may prove more effective in attracting investment and talent than flashy new construction projects. To continue reading about these cities please click here.